scrappin it: Don't you think it's too hot? Don't you think it's too hot? I think the last few days were too hot. 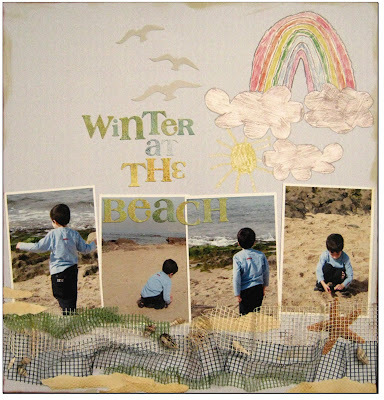 I decided to do a layout that will cool me down a little bit: "winter at the beach". This is a layout with my son's photos from a trip he went to with his kindergarten. 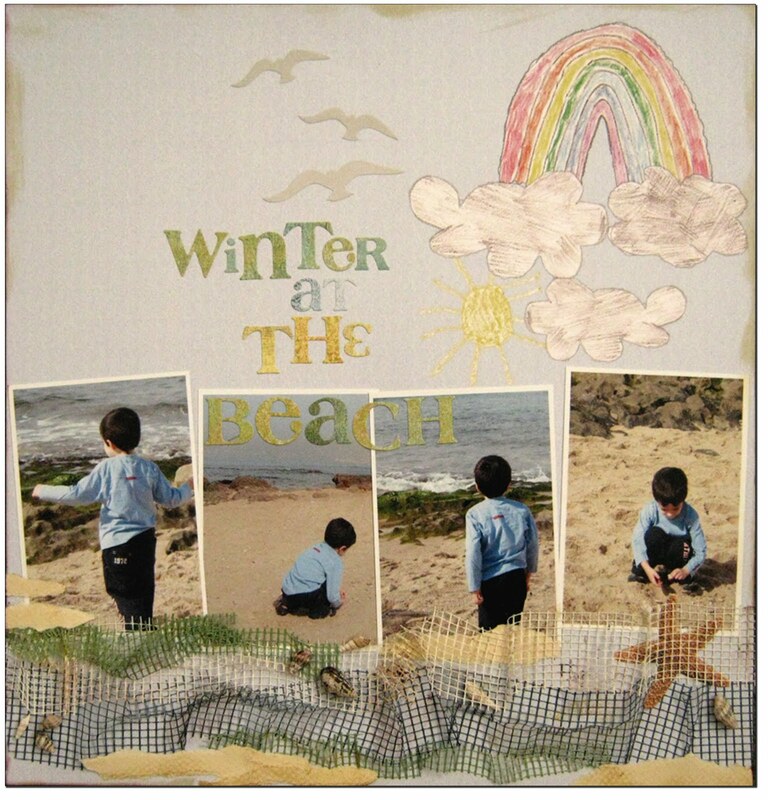 They went on a trip to the beach in the middle of the winter; they collected sea shells and played in the sand. I had these photos for a while; but I could get inspired to create a LO with them. I got my inspiration when I designed my own paper. This paper is part of my "KIDS line". All the papers were designed with real children's' drawings, my children. 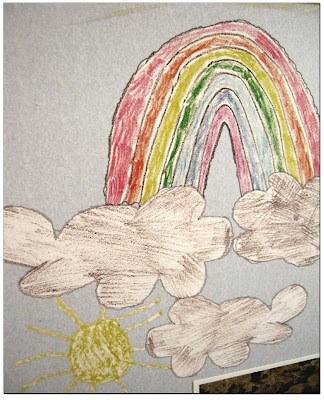 The rainbow in the clouds drawing was just the right one for this LO. It had a feel of winter and summer all together, gray skies with shining sun…winter at the Beach. Oh, I like your rainbow! Perfect for the Scrap Your Crap June challenge! Thanks for getting digi with Just Us Girls this week! What a cute idea for a layout! Thanks for playing along with us in the Just For Fun Color Challenge this week! Adorable page! Thanks for playing at Twisted Sketches! What a great layout! Love that you used the JFF colors for a beach layout! Thanks for playing along with us! You did a lovely job with this week's digi challenge from Just Us Girls. Great layout - love the images. Thanks for playing along. Sigh...I wish it were hot! I love your scrapbook page - well done! Thanks for playing with us at Stampin' Royalty. Very cute! I love the rainbow! What a great way to showcase your child's artwork too! 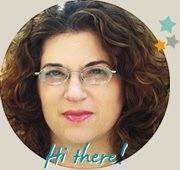 Thanks for playing along at Stampin' Royalty! Wow, a great idea! Beautiful layout! Thank you for playing with us at Scrap your Crap! A fabulous Scrap That Poetry entry Einat!! Lovely layout!!! Thanks for playing along with Just Us Girls! i love the rainbow! beautiful LO. What a great layout! Love the rainbow - perfect for this one! Thanks for joining us at STP! Fab scrap page and I love the paper. Thank you for joining in the ABC Challenge this time. Wow.. I love all the textures and the overall design. Thanks for playing along with us at Scrap That poetry! Great job on the challenge. Thanks for playing with us here at Stampin' Royalty. Wow love your paper design - so cute and a great use of your kids artwork. I love the details along the bottom. What a lot of criteria it met! Thanks for playing at Scrap that Poetry!